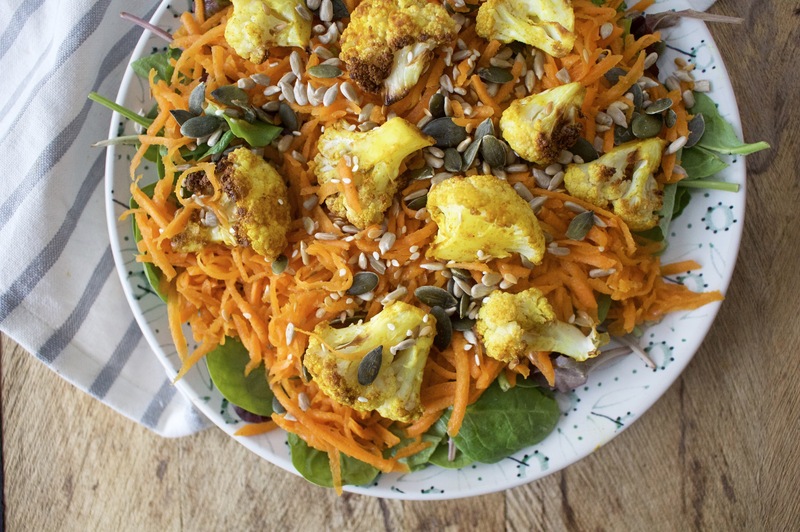 This salad is like sunshine in a bowl. It’s inspired by my favourite dish at the gorgeous LLS cafe near me in Hampstead, which if you’re ever in the area you have to visit! It’s also amazingly good for you thanks to the anti-inflammatory superpowers of turmeric and all the beta carotene packed into the carrots, not to mention good fats from the seeds. And then there’s the cauliflower – YUM. I’ve recently become a bit of a cauliflower addict (ok a lot of a cauliflower addict) although growing up I was never really a fan. But what changed? Well I discovered roasted cauliflower, which turned my world upside down to say the least. It’s just so delicious, and roasted in some olive oil, turmeric and a little pinch of salt? Phoar. I’m also a tad obsessed with this dressing. It might sound a little weird, but sesame, miso and rice vinegar are just a match made in condiment heaven – when you try it I promise you’ll understand! It goes amazingly with the grated carrots too as the flavours just work together so well. Add in some crunchy seeds and said cauliflower and we’re onto a serious salad winner here people. 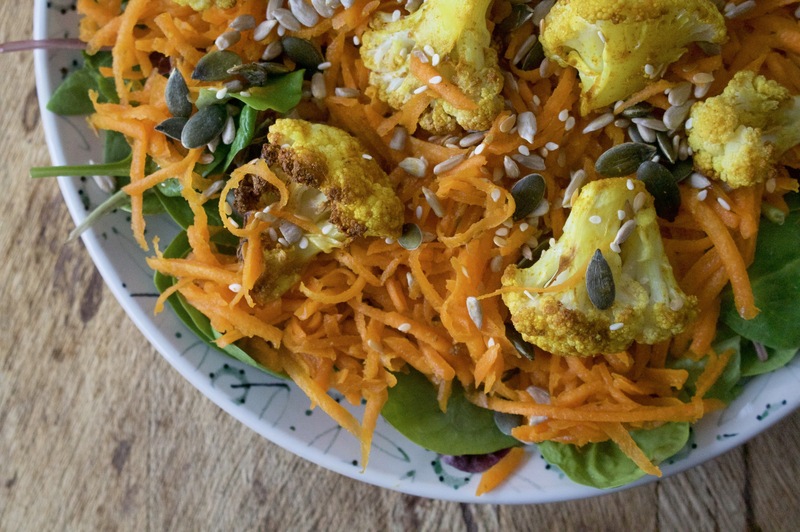 So in conclusion – this golden salad not only looks pretty, is great for your insides and super easy to make but it also tastes incredible too. What’s not to like? To roast the cauliflower, cut it into florets and toss it in a bowl with the olive oil, turmeric and salt, then pop in the oven at 180C for about 20 minutes (or until it starts to go brown and a little crispy around the edges). Leave to cool while you make the rest of the salad. For the dressing, just combine the ingredients in a small bowl and stir together well. Then pop the carrots, seeds and leaves in a bowl and toss with the dressing. 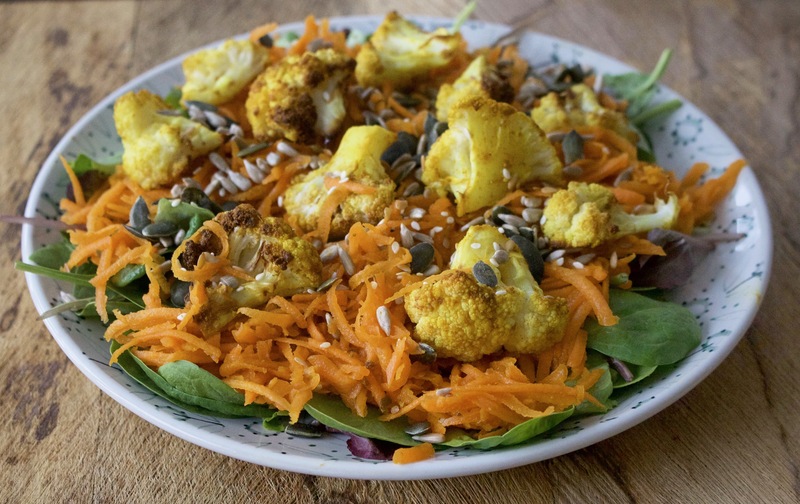 Pop on a plate, top with the cauliflower and you’re golden!